Children think they're playing, teachers know they're working! Paul produces his own maths games, which are available to order. Group problem solving to develop mathematical thinking skills. Each year has 12 sets of mystery cards, 3 colourful backdrop settings and more. • download, print, complete and post or email. An invoice will be sent with the order. Please enter a purchase order number, if used by your school. A copy of the PO can be sent after the order has been confirmed. 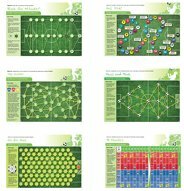 6 game cards to develop logic and reasoning strategies for KS2. A footbal setting with objectives listed on each gamecard. 10 games with specific maths objectives and clear instructions. 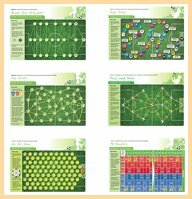 Great for reinforcing skills and concepts and keeping practise fun. We have a short record of each School main contact or Individual with the date of your order/course and we record the nature of any subsequent communication you have with us so that we can provide good customer service. We hold name and address of the school or individual for invoicing. Payment is by cheque or BACS payment through your bank and both other methods of payment are administered by yourselves. We hold no details of your bank accounts or payment details. See updated Privacy & Cookies Policy below for further details. Paul has also written many maths books. Take a look at Paul's author page on Amazon & select 'Publication Date' to see the most recent books.